Yes, Dynamics 365 is an onion. I just keep peeling back the layers of this onion called Dynamics 365 and each time, I am more impressed. Even looks like an onion with all those layers. Since the release of Microsoft’s CRM product back in 2002 or 2003, I have implemented 100’s of customers and watched the platform mature and grow. I won’t bore you with early version implementation horror stories (save those for later over an adult beverage). Today, I want to talk about the current version, Dynamics 365 for Customer Engagement. Note: If the “Customer Engagement” part of the name is new to your ears, don’t worry. You will hear more from Microsoft soon. They have come to the conclusion that they needed to separate the Enterprise CRM-type apps from the Enterprise ERP apps. I could not agree more. “Customer Engagement” apps include Sales, Marketing, Customer Service, Field Service, and Project Service Automation. 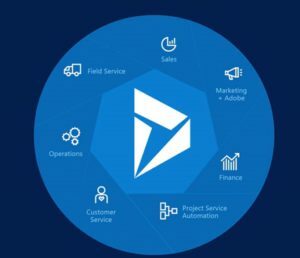 Since the release of the newly packaged and named Dynamics 365 back in the fall, Microsoft has added even more functionality and is gearing up to release two new Operations apps in July. 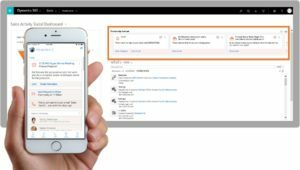 Dynamics 365 for Talent and Dynamics 365 for Retail. Considering it took a year from version 1.0 to 1.2 and then 2 years to get to the next version which was 3. (2 was skipped for a variety of reasons). Then a series of 2 or 3 year release cycles for a while. Why do I bring that up? Because now, Microsoft is in a 6 month release cycle for the product. And the platform has benefited greatly for it. Enough history, you say. Why should I switch to Dynamics 365 now, you ask? There are 100’s of reasons, we’ll take my current top 3. The platform has matured well and contains individualized apps you can license separately or together under a plan license. That’s not one of my three reasons but it’s important. Make sure you work with your partner to license only what you need. I cannot stress the importance of working with a certified Dynamics 365 Partner (like us, of course) enough. A successful implementation is as much about your business process as it is anything else. A good partner squeezes your process from you and helps re-imagine it if needed before implementing it. Ok, each of these 3 reasons is a blog post in itself so please reach out for more information. Insights driven functionality in the Dynamics 365 for Sales module is leaps and bounds ahead of anything else out there. Using AI (Artificial Intelligence) to help focus your Sales team to make the right decision and take the next step sooner. Dynamically reminding them of actions that need to be taken. Priceless! Add this to the workflow and business process flow capabilities in the new tool set, you have a unique and powerful set of tools to configure just the right mix of processes and datasets to make your sales users happy. The old experience with Outlook was to install an add-on and deal with the added performance hit since Outlook is a resource hog. The new app is a lightweight, admin driven connection that works the same in the desktop Outlook client or the Outlook web client. 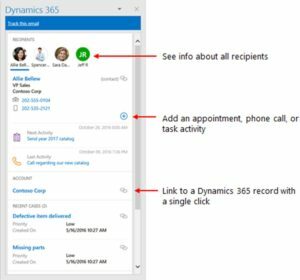 Easily link emails to the proper record in Dynamics 365. Our ability to take your requirements and objectives, design an effective solution, and then configure it for you is easier than ever. All the Dynamics 365 apps work together to deliver a cross-department experience using a single dataset. I don’t want to use the word “integration” for this because that is over-complicating it. That phrase in vogue now – lead to cash – is truly a reality and delivering it more quickly in Dynamics 365 is our goal. There is much to like about Dynamics 365 and how it stacks up favorably against ANY other platform in the market today. We would love to discuss your immediate needs and implement a solution that makes sense for you. Contact our Sales team today for information and guidance. By Ken Farmer, President, Dyn365Pros, Microsoft Dynamics 365 Partner, Southern California, San Diego.